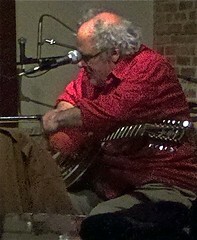 Eugene Chadbourne is to country music what Monthy Python was to situation comedies. He played a show in Ithaca last night with improvisational percussionist Tatsuya Nakatani, covering Johnny Cash, Merle Haggard, Hoyt Axton and more. I’ve been playing a lot of live/improvisational music lately, and participating in a lot of improv communities. But I don’t like the sort of completely out-of-control insanity that characterizes musicians like Frank Zappa (with whom Chadbourne played) or Captain Beefheart. And the opening improvisation last night, I wasn’t sure I would stay for the whole show. It wasn’t musical. Wasn’t musical? That’s a separate essay — a long one — but last night the specific problem was that the rhythms were changing constantly and there was no resolution — no tonal center. The music had no home to return to, and therefore to my ears, did not develop and never went anywhere. All gin and no tonic. Many jazz musicians and classical composers work like this deliberately, but I don’t like their work at all. Luckily, it didn’t stay this way. By the end of that improvisation there was the hint of a center, and he segued into what sounded very much like a modal old-time banjo tune. And then from there he went to very twisted covers of some country classics. Nakatani amazingly kept up with everything he did, no matter how insane or how unpredictable. It was in fact often hard to tell who was driving and who was following. Sometimes Chadbourne drifted into outright mockery, which is maybe appropriate for Roger Miller’s “Dang Me,” but Patsy Cline and Hoyt Axton deserve more respect than they got last night. On the other hand, Johnny Cash’s “I Still Miss Someone” was as beautiful as it should be, and as twisted as everything the duo did — concluding with Nakatani singing high harmony while abusing a cymbal. It was quite an evening and when we found out the next morning we’d missed a Margaret Atwood reading we were disappointed but then thought, hey, Margaret Atwood and that show on the same night? How cool is that? This entry was posted in Uncategorized and tagged improvisation, music. Bookmark the permalink.